A few years back, there was a clear understanding that choosing cross-platform development posed a number of risks, and most companies who wanted a mobile app clearly benefited from developing one for a particular mobile platform. Then, the default perception was that a cross-platform product was less user-friendly in terms of design, less reliable, and more difficult to update. Gradually, as cross-platform development tools have evolved, this perception has changed. Whether to develop a native mobile app or go for a cross-platform app still remains one of the most challenging questions for an entrepreneur hitting the mobile app market, but these days there is more value seen in cross-platform products. What do we have in mind when we say “cross-platform application”? Native cross-platform apps are created when you use APIs that are provided by the Apple or Android SDK, but implement them in other programming languages that aren’t supported by the operating system vendor. Generally, a third-party vendor provides an integrated development environment that handles the process of creating the native application bundle for iOS and Android from a single cross-platform codebase. In this case, the final product is an app that still uses native APIs, and cross-platform native apps can achieve almost native performance without any lag visible to the user. 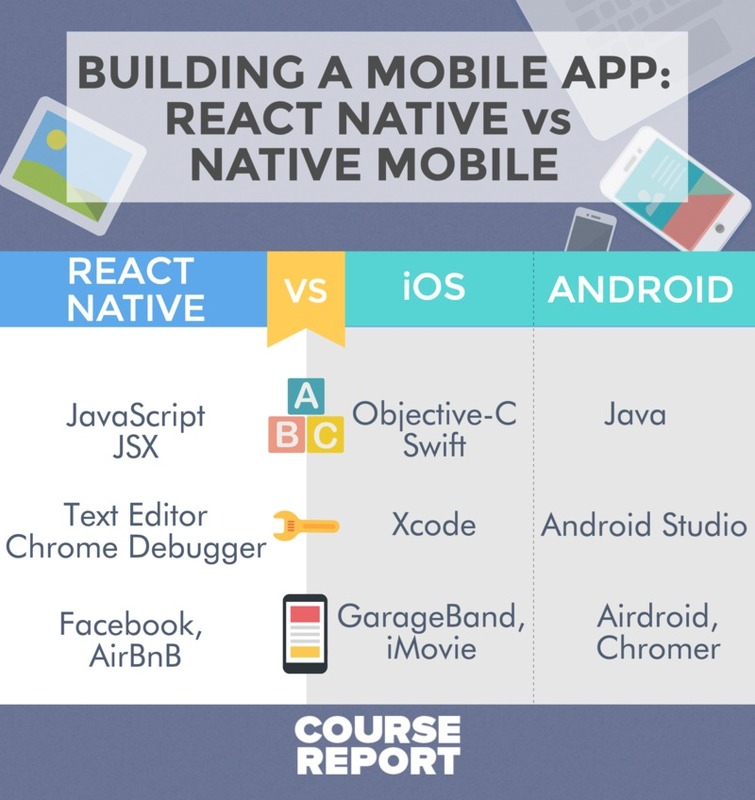 NativeScript, Xamarin, and React Native are the most common examples native cross-platform languages. Hybrid HTML5 cross-platform apps have never gained too wide of recognition because this approach to development results in performance issues when an app’s UI is rich in components. HTML5 cross-platform apps have always struggled to achieve a fully native look and feel, since they are basically WebViews that run in browsers. Often, cross-platform apps are cheaper to build and maintain due to a number of factors. 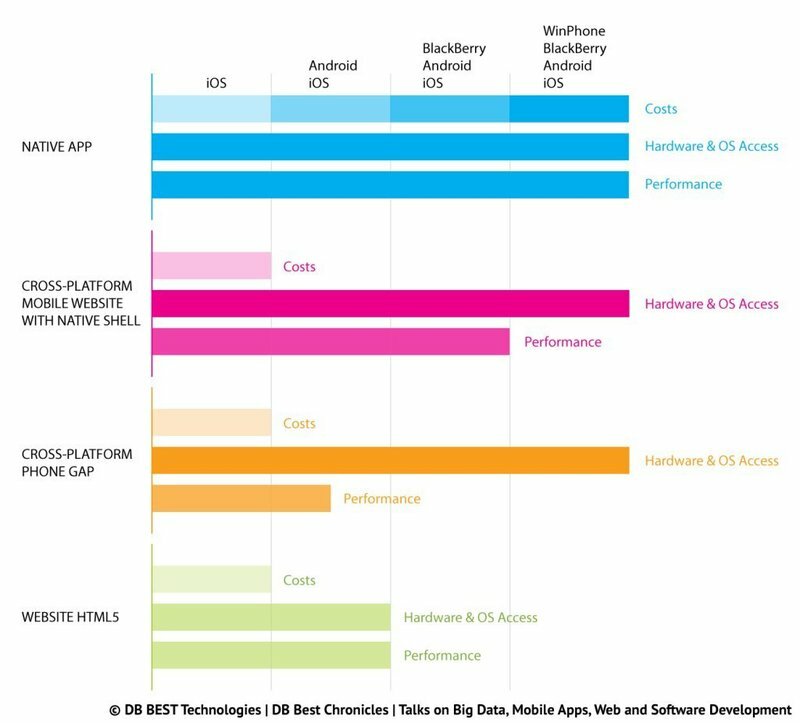 When cross-platform apps are properly architected, at least half of their code can be used across platforms. Developing a cross-platform application also means lower expenses in terms of quality assurance. How so? A cross-platform application has UI elements that are specific to each platform, plus a common codebase that contains the app’s general business logic. Developing a cross-platform app can’t help you with potential UI bugs, but it means that your debugging takes less time in total because you only need to fix bugs that are in the common codebase once. Unit tests also have to be written only once for the common code, which saves time and resources for testing. Product owners who want a cross-platform application need only one team of developers that are trained in one set of technologies. A smooth and enjoyable user experience is critical for any app. And consistency is one of the crucial characteristics of a well-designed UX. What do we mean by consistency? We mean that users are able to recognize UI elements and predict their interactions across multiple platforms (web or mobile). When the first cross-platform apps appeared on the market they lacked this uniformity in UX. That’s why a lot of people were reluctant to use them. The latest generation of cross-platform development tools allow developers and designers to create the uniform user experience that app users appreciate. Developing a fully functional prototype is a common and advantageous strategy for a product company or innovative startup that wants to see if its idea has product-market fit. React Native is ideal for prototyping, allowing for quicker development and release of an app that works on Android ad iOS at the same time. Quicker development provides product owners with an opportunity to collect user feedback and to secure a patent and a spot in the market. Many people feel that they have to hit the market with their innovative product as soon as possible before somebody else seizes the opportunity. React Native allows you to get to market without sacrificing the quality of your code and end product. Mobile apps serve as tools for promotion and as sales channels for various businesses. As such, cross-platform apps are more useful for many business owners because they provide a wider reach: by creating one application you can tap into both iOS and Android target audience markets at the same time. What cross-platform development tool should you choose? NativeScript was created by Telerik, a Bulgarian software development company, and for several years in a row NativeScript has been chosen by Gartner Magic Quadrant for Mobile Application Development Platforms. Xamarin is a Microsoft-owned cross-platform development tool that uses a C# codebase to develop cross-platform mobile apps for Android, iOS, and Windows devices. Xamarin allows code sharing on multiple platforms, and it has a cloud service that allows mobile app testing on various devices. With Xamarin, developers can use popular Portable Class Libraries (PCLs) like SQLite, Json.NET, or ReactiveUI on every platform. The Xamarin Component Store provides access to high-quality components that can be added directly to an app from the IDE. These components include a number of controls, web service APIs, and more, and also enable integration with popular backend solutions such as Microsoft Azure and Salesforce as well as enable integration with powerful security features including authentication and encryption. The choice of a particular cross-platform development tool will depend on a number of factors and the needs of a particular project. At Yalantis, React Native is our top pick. Why do we prefer working with React Native? 2. React Native is UI focused: a UI created with React Native feels fluid and is highly responsive. 3. React Native relies on fully native controls. With React Native, developers write a regular React-based application but the app has native controls, which results in smooth performance that borders on a native feel and user experience. Secondly, React Native does this using less memory and loading fast. This makes React Native-based apps a good cross-platform choice for older devices on which other cross-platform solutions would cause more lag. 4. React Native lets developers reuse code. Native UI components can be applied with modifications to existing app code. This makes React Native a perfect fit for projects where product owners want to augment an app they already have without building a new one from scratch. 5. React Native supports native modules. React Native allows you to use third-party native libraries to implement various features including geolocation, encryption, payment system integrations, and specific calculations. The cross-platform development approach has become widely accepted because it solves a number of problems typical of native development, and in doing so satisfies both technical teams, product owners, and end users. Native application development might still be your first choice, but don’t disregard what cross-platform development has to offer you until you’ve looked into all the options.